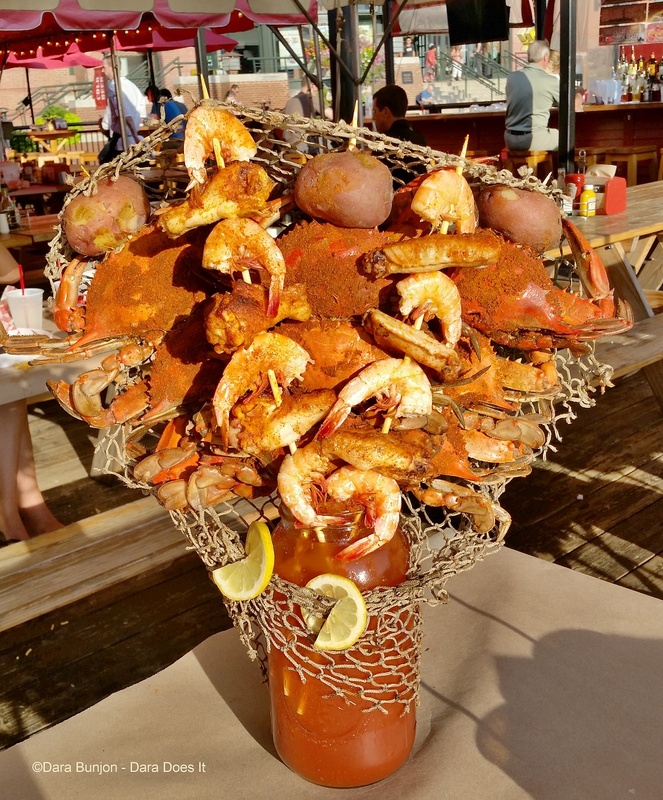 Come the weekends with brunches in full swing, Instagram is saturated with snaps of the latest and greatest Bloody Mary’s topped with bacon, burgers, ribs, chicken almost every concoction of food toppings but nothing like Phillips Seafood’s Crab Feast Bloody Mary Meal. A pitcher of Bloody Marys bedecked with skewered Maryland steamed crabs, jumbo shrimp, chicken wings, corn and baked potatoes all draped with fishermen’s netting and lemon slices presented with plastic cups rimmed with their seafood seasoning and a ladle to fill those cups with local favorite, George’s Bloody Mary Mix, and jalapeño-infused vodka – you should be full just reading this! The Crab Feast Bloody Mary won’t be around long, it is a limited engagement available only on Saturdays and Sundays at Phillips Crab Deck where you can enjoy a nice breeze, great view, people watching and when we were there, live music. Phillips Bloody Mary Crab Feast brought oohs and aaahs and it was placed on our paper-covered table and diners lined up to take photographs. 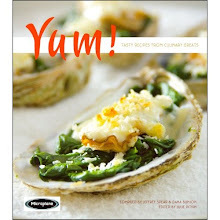 The real fun began digging in, what first a steamed crab, no shrimp; no, let’s have a taste of the chicken wings. My gal pal and I put a serious hurting on this gargantuan Bloody Mary Meal – I think there was only a potato left when we cried uncle. Don’t want anything that large, you can order Phillips’ Bloody Enhancements that are available daily with options like: soft shell crab, grilled chicken, crab cake slider, slab cut bacon or a hard shell crab. 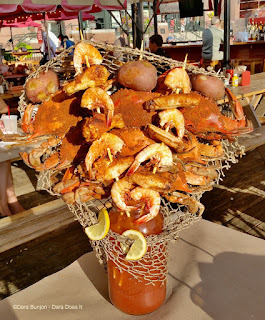 Our thanks to Phillips Seafood for inviting us in to partake of the this amazing Seafood Bloody Mary – a great deal for $100 – 64 ounces of Bloody Mary, steamed crabs, shrimp, corn, chicken wings and the perfect atmosphere for indulging in a Maryland tradition – a crab feast, mallets included. Phillips Seafood is no flash in the pan, the 100 year old Phillips started on Hoopers Island, Maryland as a processing plant for crabs, fish and oysters from the Chesapeake Bay. Phillips Restaurants opened in 1956 in Ocean City, Maryland and grew to multiple locations and expanded into a retail line of seafood.